Inflammation is linked to many of the most serious diseases. I don't know about you, but I take something like that seriously. If I can eat foods that promote health, but in delicious and beautiful combinations, then I'm all for it! Healing and preventing inflammation means upping your fruit and veggie intake. I try to get at least 5 cups of fresh fruits and vegetables each day. I didn't always enjoy salad, but now I really do. I like to add a little something hearty to many of mine. Sometimes I'll fry up homemade croutons in olive oil or use nuts if my salads are meat-free. It gives you something to chew on and enjoy besides just vegetables. Another options is potatoes. Over the years, I've found that adding a little potato helps keep your tummy full between lunch and dinner. I've added cubed leftover baked potatoes and sauteed them in olive oil, salt and pepper to use as "potato croutons". I've added boiled new potatoes tossed in olive oil and rosemary. I've made potato pancakes and used those to top salads. But until now, I've never tried potato chips. I think I'm onto something with this idea! Preheat the oven to 450 degrees. 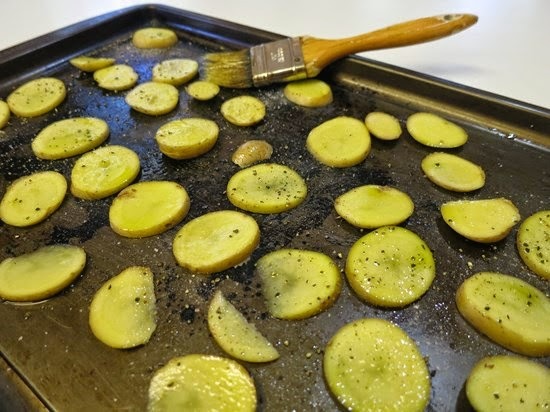 Get out a cookie sheet and using a pastry brush, cover it with a light coating of olive oil. Slice the potatoes thin and spread them out to cover the sheet. Dab olive oil with the pastry brush on each potato slice. Season with salt and pepper to taste. Bake for 20 minutes or until potatoes have color and look ready to eat. Make the mayonnaise topping. 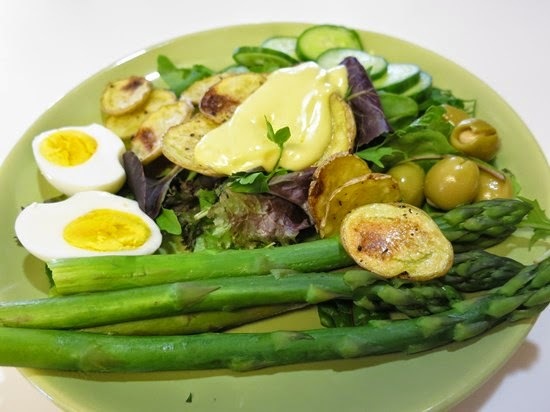 Add the egg, lemon and Dijon to the bowl of a food processor and process. Drizzle in the oils drip by drip while blade is running. Add the salt and pepper. *More on getting at least 9 fruits and veggies a day. Of course, even more is better. Here's an example of what I might call a really good fruit and veggie day. I'd start the morning with a Super Green Smoothie (6+ right off the bat), have a salad for lunch (5), yogurt plus fruit mid-afternoon (1), a side vegetable (1) and another salad (4) with a protein or grain for dinner and fruit for dessert (1). Grand total = 18+. As alternatives, soups and stews are wonderful ways to pack even more vegetables into meals, and some of my favorite foods. .